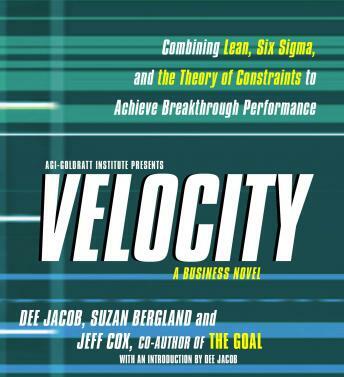 Dee Jacob and Suzan Bergland, two principals of AGI–Goldratt Institute, have teamed up with Jeff Cox, the writer of The Goal, to introduce the powerful Velocity approach for focused business improvement. Developed by AGI, the Velocity combines the three leading continuous improvement methods—Lean Theory, Six Sigma, and the Theory of Constraints. Based on its extensive experience implementing the Velocity approach, AGI has delivered extraordinary results with remarkable speed for clients such as Corning, Procter & Gamble, and the U.S. Air Force and Navy. Written in the same compelling style that made The Goal such an enduring classic, Velocity is an engaging novel that tells the story of a company called Hi-T Turbine that is grappling with bottlenecks in sales, manufacturing, and product development. The story vividly shows how the company initially fails to succeed because it concentrates only on local improvement. Only when it begins to take a holistic view of the entire company does Hi-T then quickly turn its business around—realizing significantly reduced operating costs, increased sales, shorter production times, better quality control, and substantially improved profits. The story unfolds in a real world fashion that can engage all members of any organization. Velocity is the vital resource that business people need for delivering urgent business improvement in these challenging economic times.